Multimedia and video production is a popular medium for student products these days. However, schools often lack the resources or funds to supply teachers and students with the proper software. Luckily, there are several tools available online that can help in this arena. If it’s a video editing tool you need, YouTube offers a free one that is easy to use and internet-based. Not only can the popular video site provide free hosting, but this tool allows users to edit their videos without purchasing costly software. Mashable offers some great tips for getting the most out of this fantastic online tool. What are some tools you use with your students for video projects? How might you get the most out of the tools listed above? For this week’s tip, we’re bringing you a list of top-10 ways you can use social media in your classroom. 10. Social bookmarks like Delicious (still around), EverNote, and Diigo are great ways for groups of students researching a topic to gather and organize their resources. You can set up an account for an entire class, a small group, or one for individuals who share and follow their peers’ research. 9. As mentioned earlier this week, there are many new uses for YouTube (and other social video sharing sites like Vimeo). Channels can be created. Response videos and creative annotation and tagging can add another interactive level to the video sharing process. 8. Google Reader (H/T Brooke Higgins) can be a great way for teachers and students to follow particular resources as well as share in a community. A teacher can create a bundle of important resources to which he wants his students to subscribe. There is also the share feature where students and teachers could share interesting articles or blog posts they find in their own readings. The comment and search functions can also come in handy with Google Reader. 7. The new Groups on Facebook make it even easier to communicate with students and parents without having to give up privacy via friending. There are many more privacy safeguards for the new Groups, but there are also several new features that make Groups more community-friendly. Now, when comments are made on the new Groups’ walls, that same content shows up on every member’s feed and sends a notification. This insures that every member sees all the wall posts. Also, there is a group chat that allows more than one participant at a time, great for online class discussion. Documents, pictures, videos, links, and events can all be managed in one place. 6. Teachers and schools often complain about the cost of out-dated textbooks that don’t match student needs as closely as they should or are limiting in their scope. A great way to combat this is to write our own textbooks using wikis. Not only could a wiki be used to display a teacher’s notes, but there are multimedia capabilities as well as commenting options. Even better, students can be involved in writing their own textbooks. A wiki-created text could be revised and edited from year to year without the cost of a new textbook series eating up valuable space in a school’s budget since wikis are often free or very cheap for premium, ad-free packages. Oh, and there’s a wiki out there with directions for writing a textbook. Google Docs has its own presentation feature, much like PowerPoint. In fact PPT files can be uploaded to Google Docs and converted to an online presentation. Students working from different computers or locations can easily contribute to the same presentation. When presented to the class, students can chat during the presentation and the discussion shows up on a side panel. Collaborative writing has never been easier than with Google Docs. Using the word processing feature, students can contribute to the same document, insert comments, chat about the direction of the document, and access older drafts. Plus, the document can easily be converted to a PDF or website. Data collection and online tests quizzes are easier now with the addition of Google Forms to the Docs suite. A form can be set up to gather any data (surveys, quizzes, blog submissions 😉 ) and it’s all gathered in a tidy spreadsheet that can be easily converted to charts and graphs. Plus, multiple users can gain access to the results, as with any Google Doc. 2. Photo sharing sites such as Picasa and Flickr offer great opportunities not only for sharing and commenting on one another’s images, but also several other useful features. Tagging and/or annotation images is a great way to demonstrate understanding and to encourage contributions. Both offer some editing features and allow video uploads. 1. Blogs. Well, what else would you expect from a blog? Blogs are a tremendously underused social media tool. Collaborative writing, online publishing, interactivity between readers and writers, easy to manipulate HTML code with multiple options for embedding media… The possibilities for blogs is endless. Plus, blogs can be used alongside many of the tools already mentioned above. 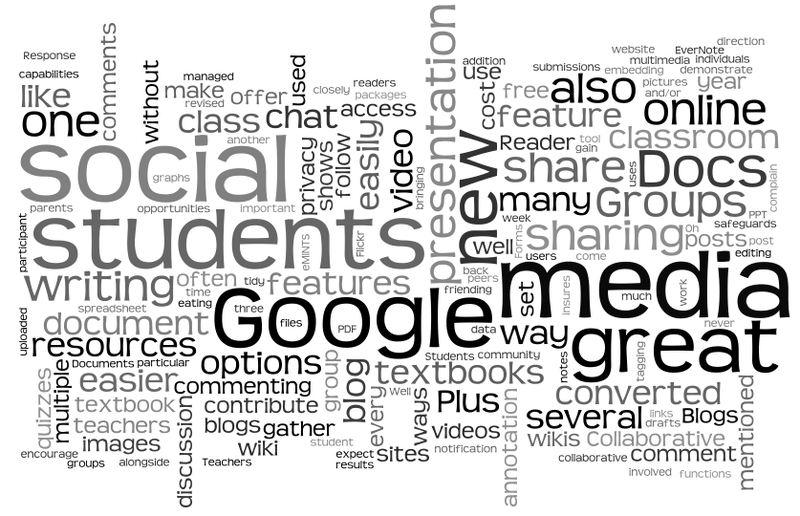 How do you use social media in your classroom? Feel free to comment below or link back to this post.